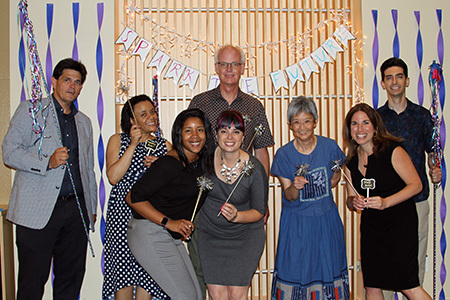 Over one hundred educators, industry mentors, and other professionals gathered at Agilent Technologies in Santa Clara for the annual celebration of Ignited’s Summer Fellowship Program. For the past 33 years, this program has offered Silicon Valley teachers unique opportunities to work at a local company or research lab and then translate their own real-world experiences into immersive STEM curriculum for their classrooms. This is a transformative experience for Ignited Teacher Fellows, who have impacted 3 million students. Next, the audience heard from two Ignited partners and advocates. Darlene Solomon, the Chief Technology Officer of Agilent Technologies, described Agilent’s longstanding commitment to STEM education and highlighted the outstanding work of Richard Hanson, a Teacher Fellow from Amador Valley High School who spent his summer at Agilent Labs. Steven Currie of the San Francisco Public Utilities Commission then shared his enthusiasm for the fellowship model and working with Ignited to pilot new programs such as Spark Early Education STEM (SparkEES). Last but not least, a highlight of the evening was hearing from past and current members of Santa Teresa High School Robotics Team: William Thammasouk, Alexis Thammasouk, Vikasni Kalahasthi, and Erika Estrada. 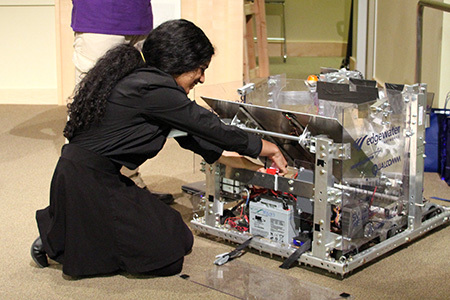 They talked about what made robotics interesting to them, showed off their robot, and described how their coach and physics teacher Deb Dimas had expanded the team from a handful of boys to several dozen boys and girls by making the task of building a robot exciting in unexpected ways. They mentioned design thinking, teamwork, leadership, entrepreneurship… and, of course, competition.